Navdeep Bains said the government is talking to GM about supporting its Canadian investments and expects to give further details "in the coming weeks and months." TORONTO -- The federal government is working closely with automakers to increase investment in the industry, Canada's top economic development minister said today, welcoming the agreement reached between Unifor and General Motors. "We're currently working closely with the automakers to make sure that we look at means to bring investment and I'm very delighted to hear about the agreement between GM and Unifor. 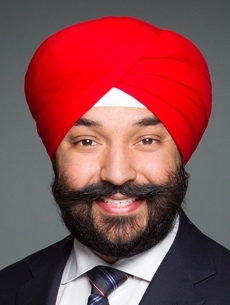 That's a very positive development," said Navdeep Bains, minister of innovation, science and economic development. Unifor, which represents more than 20,000 Canadian autoworkers, on Sunday ratified a deal with GM that will see $554 million invested in local plants. It is also preparing for talks over similar deals with Fiat Chrysler Automobiles and Ford Motor Co.
GM spokesman Tom Wickham said on Sunday that the company is working toward "potential support agreements" with federal and provincial governments. Bains said the government is talking to GM about supporting its Canadian investments and expects to give further details "in the coming weeks and months." "We have many tools in our toolbox and the idea is for us to engage with them to increase investment," Bains said. The government said in its 2016 budget that it would extend the Automotive Innovation Fund, which uses government funds to encourage industry investment. The federal government recently agreed to offer automakers grants rather than loans, which helped both sides reach a deal, according to a source directly involved in the talks. Bains declined to comment on the grant situation.